2. There is an inherent culture that "the cause" is so important that extrapolating beyond the validated science is OK and indeed should be encouraged. "of course -35C in US shows climate change is increasing extreme weather events"
. Helena somebody uses the -35C temps in the US to say "deny as they will" this shows Climate Change leads to more extremes. At least Marr calls it Global Warming but agrees we won't see a gradual rise but more extremes. So, deliberate or not, the "extreme meme" is getting a good airing again. All unchallenged of course, can't be having any false balance can we. 1. This theory is not validated, and is generally considered unproven by acadaemics, with even the extreme IPCC, not upholding it. 2. Marr was negligent in not pointing this out, he should have been better briefed. Remedy : next prog should read a complaint letter, and agree to better briefing to to stop it happening again.... but we know BBC policy is not to admit mistakes. Harrabin writes the headline .."Storms .. Climate Change no ruled out - say Met Office"
...and then using fakery and spin to show that story rather than genuine reality. Radio 4 iPM had a prog one week where a amateur weather expert debunked ice scares by pointing out Frost fairs used to be common for centuries in London but not every year, and a royal sleigh was used. - The next week they balance this by having the same expert talk about extraordinary December 2013 rains as the worst in 150 years, but they made no attempt to push "the cause by climate change agaenda"
Expert "worst rain ever meassured in 150 years of measuring"
Jan 10: BBC Radio 4: Brickbat-wielding climate sceptics have "a lot of very powerful voices in politics and elsewhere"
Jan 09: BBC Radio 4: Andrew Luck-Baker: climate sceptics guilty of "saloon-bar pseudoscience"
Jan 09: BBC Radio 4: Antarctic expedition used by "deniers" "as a brickbat to beat scientists and the science"
Jan 05: BBC Radio 5: Sir David King's "simple notion" - severe weather "may now be happening more frequently"
Jan 04: BBC Radio 4: Beddington: weather today due to "greenhouse gases that were in the atmosphere in the 1990s"
Justin Rowlatt: So are democracies capable of getting to grips with such a massive, expensive and long-term challenge? I spoke to another oil man, John Hofmeister, who was Chairman of the Shell Oil Company until 2008. Does he think the world is ready to make the leap to a carbon-free economy? John Hofmeister: I think we have to say, bluntly: the world is still committed to hydrocarbon energy. There is not the political will or the political courage to go in another direction, anywhere in the world today. Global leaders are not concentrating on this issue, and they won't until the people of their nations require them to, frankly. We're going to continue to use hydrocarbons for as far into the future as we can see. Justin Rowlatt: Yeah, and if you look at the science, that means that we're going to suffer very serious climate effects that are going to make it harder for human beings to live on the planet. And by the time people realise that, and they demand change of their leaders, what the science says is it will be too late. John Hofmeister: And I agree with you. On a list of 25 important priorities in the United States today, environment comes in about 22nd, among the population. That's a leadership failure. Justin Rowlatt: So are you saying this is a failure of democracy? John Hofmeister: I think it's not the form of government that matters, it's the performance of government that matters. And democracy's performance is terrible! And it's largely because money influences democratic outcomes. Justin Rowlatt: Clearly there's some truth in that, but there is also a problem that, inherently, democratic politicians look to the next election - there's an in-built short-termism in democracy and it finds it hard to deal with long-term challenges, like climate change, particularly ones which ask for self-sacrifice. John Hofmeister: Absolutely. And I use the expression "political time" - meaning the time between now and the next election - "trumps energy time or environmental time, all the time", absent a crisis that pushes the popular will to do something very differently. Justin Rowlatt: Is this an argument that until the climate gets so bad that ordinary Americans recognise there's a serious problem that needs to be dealt with, democratic countries will not generate the leadership necessary to do something on this issue? John Hofmeister: More than likely. I agree with you. John Hofmeister: Well, most of us alive today will be dead. But our children will suffer for our lack of will, and we will have placed upon our children's and grandchildren's shoulders, a burden we did not care to bear. No report yet(?) on the BBC of this ITV Poll, published a week ago. UK poll: 62% don’t believe in man-made climate. What was also really interesting but unreported about this study is that the wealthiest and most educated are more skeptical and those with the lowest income or shortest education were more likely to believe that humans are affecting the climate. In the upper middle class 36% think the floods are due to human activity, and virtually the same percentage — 35% are skeptics. In the manual worker and less skilled social bracket 44% think humans are to blame, and only 28% are skeptics. The skeptic message is winning over the upper class, better educated bracket. Presumably the rest will follow. -I don't like it cos it uses a warmist propaganda technique of adding the "non-believers" and the "don't knows" together to assert the negative, to say the majority don't believe, instead of the largest group believes. It's impossible to keep up, as well as the systematic daily biases , there have been recent whole series used as vehicles for one sided climate alarmism as their presebters see their role as true eco warriors. - most BBC science progs are happt to report every green science story from the extreme end without any balance or chalkenging to add perspective, not cqring that time inevitably proves them wrong. Might be interesting to see what Bang Goes the Theory has to say on Monday. Will they conclude there's an energy shortage? Will they admit that green policies are largely responsible? I won't be disappointed, but then I have no expectations of the BBC any more. - seems itbwill have stuff on Gas Turbines, but will probabky hype smartgrid theory as some kind of working magic. "Presenters Jem Stansfield, Liz Bonnin and Maggie Philbin investigate how close Britain might get to running out of electricity. We live in a world where the lights are always on, but will that be the case in 20 years time? Maggie Philbin spends a day in one of Britain's most secret locations, the control room of the National Grid where she monitors our demand for electricity with supply. Here she learns almost half our generating capacity will disappear in our lifetimes. Jem shows how and why most of our electricity now relies on gas and reveals a potential fuel of the future - liquid air. Liz investigates renewable energy and tackles what could really offer viable solutions to our energy needs going"
Interesting & will watch it either live or on iPlayer. Here's my 2 cents: we'll get to hear quite a bit about demand reduction - smart meters and having to do things like using washing machines in the early hours of the morning, for instance, not when we want to use them or when it is convenient for us. The "low-carbon economy" will be something we'll have to adjust our lifestyles to, rather than the other way round. The rationale for this lowering of horizons probably won't be examined or questioned, and as Tiny CO2 has said, it's unlikely they will blame green policies. "using washing machines in the early hours of the morning" yes, I'm expecting much the same but it would be in direct contradiction of their advice of a few days ago, never to leave washing machines and dishwashers on over night because of fires. After the heads up I made a point of watching Bang Goes The Theory tonight. By past BBC standards it wasn't too bad. Mentioned the intermittentency of wind, but not the unpredictability, mentioned that there can be a lack of wind all over Europe but not the duration. Didn't mention how close we are to the lights going out, gave the impression (to me) that 2020 was when we should start worrying. For fraccing it seemed anti on balance. They didn't really cover how the CCA of Ed Milliband was a key reason why we faced the problem perhaps a symptom of the bias. It did mention gas imports from Russia and Middle East but left it to the viewer to work out that if you had to import anything then Russia and the Middle East would not be the first two places you'd choose. The worrying parts for me was how keen they were on storage of power from wind. A long period (more than a few days) of a windless Europe would mean a continental problem as any storage would be used in less than a week in my opinion. The other was the enthusiasm for smart switching off of power to "non-essential" uses and users and how it would save "carbon". The example was the Marriott Hotel in London when no one (apparently) noticed the air-conditioning being turned off for an hour. In summer the answer might be different. Most of the domestic and non-domestic equipment that this could apply to is fairly well controlled already, only switching on and off as required. I can agree that switching off large numbers of fridges, freezers and air-conditioners for a couple of hours will stop the grid overloading. But they will all have to get back to the user settings again afterwards and the total energy used will be the same, the "carbon" saved will be virtually nil at best. I watched Bang Goes the Theory last night as well, but wasn't impressed, especially with the rather manic chap doing the experiments., and the woman who waved her hands about a lot and spoke from under her hair. Going into a hotel for a facile vox pop and asking the people inside if they had noticed the power being turned off - they all said no, of course- but you had no idea if it was air conditioning or central heating, hot or cold outside, what the temperature change had been, if any, inside, how long the power had been off when she asked them, if the guests had just walked in, etc etc. The liquid air experiment was quite interesting, but then showing a small battery about 1ft sq. if that, and saying that billions would be required to provide backup for the intermittency of renewables didn't impress me either. It wasn't as bad as it would have been 2-3 years ago. Citing renewables as supplying 10% of Britains energy was a bit naughty. Yes, it did during December 2013, but this fluctuates from virtually zero up to 10%. Trying to juggle a variable power source that comprises around 10% of our needs, and presumably in future very much more than this, is somewhat worrying. What happens when the wind stops blowing and we have a 20% shortfall? Their glib answer to that was that with a pan-European network, the wind will always be blowing somewhere so there should be enough power. I agree with both your posts, and the glossing over of all the problems most of which are unsolvable with current or known technologies. 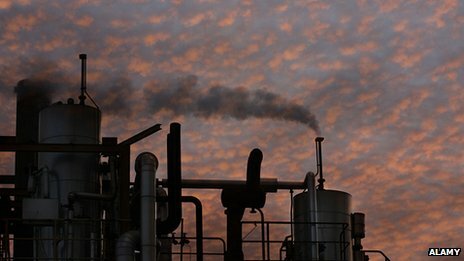 BBC article "Coal gasification: The clean energy of the future?" Time and again, we see photographs of various industrial sites where the innocent observer is led to believe that the plant is belching out black smoke when it is really white steam. Thus the Sundby gasworks in Danemark are portrayed like this by the BBC, when they could have chosen this less deceptive alternative.